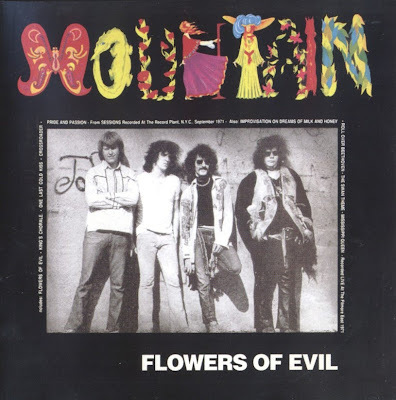 Formed in 1969 by Felix Pappalardi after the demise of Cream (he was their producer) and Leslie West (ex Vagrants), Mountain was one of the first successful hard rock acts, in the same style, not surprisingly, as Cream. Although their apparent leader was the huge Leslie West, Pappalardi was in fact the bands musical director, producer and main songwriter. A respected musician, he began working in the mid-60s on the New York folk scene and played with Fred Neil, Tom Rush, Richard Farina and Richie Havens. He was also a producer and worked with The Youngbloods, Apple Pie Motherhood Band, Bo Grumpus, Hot Tuna, Devil's Anvil and Canada's Kensington Market. One of their first appearances was the Woodstock Festival and two songs: Blood Of The Sun and Jack Bruce/Pete Brown's Theme For an Imaginary Western appeared on the Woodstock compilations. Their first album Climbing was "made to be played loud" and sold well, Mississippi Queen also being released as a 45. It's probably their most interesting effort, the songs being well structured and penned by West, Laing, Pappalardi and his wife Gail Collins. Mountain toured constantly and four more albums were released in two years, still in the same vein: loud guitar, bass a la Jack Bruce, plus heavy percussion and keyboards, with occasional "lighter" cuts. The vocals were shared between Pappalardi and West. The group first broke up in 1972. West and Corky Laing attempted to revive Cream with Jack Bruce forming West, Bruce and Laing for three albums. In 1974, Mountain reformed without Steve Knight for two best avoided efforts. Leslie West then went solo and released two uninspired albums for Phantom in 1975: Leslie West Band and The Great Fatsby, the later with Mick Jagger. Corky Laing later released Makin' It On The Street (Elektra 7E-1097) 1977 with Clapton and played with various Canadian hard rock groups. Pappalardi recorded two solo records in 1976 (Pappalardi And Creation) and 1979 (Don't Worry Mum). He was stabbed to death in 1980 by his second wife. From time to time, Mountain have reformed and issued new albums (the last one in 1998).